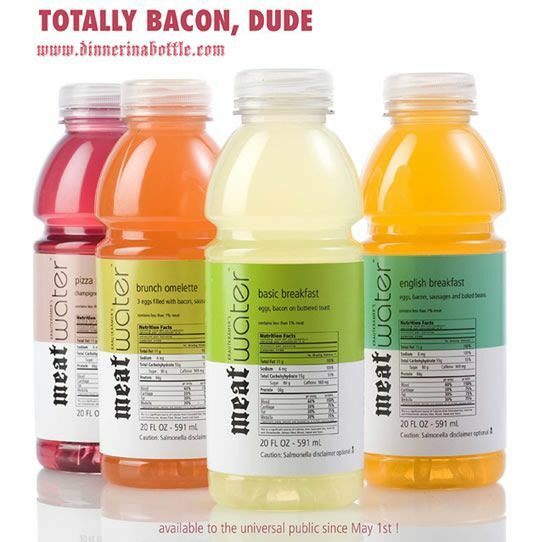 Have a Drink of… Meat?! How would you like a refreshing glass of Beef Stroganoff water? Or maybe some Meatball juice? Or a swig of liverwurst sandwich? 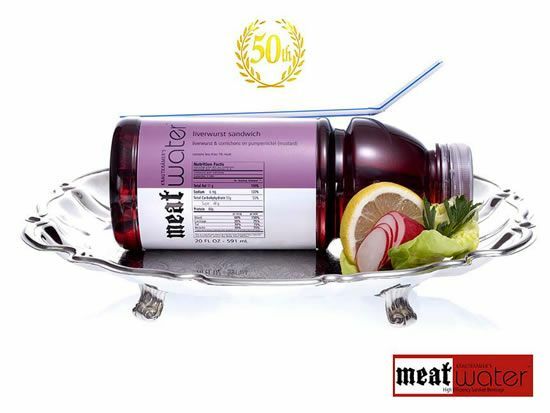 Well, I have to admit that I am not sure if this is reality or a hoax… (It seems like that question is quite the debate over the world wide web these days) but Meatwater, a new line of hearty — and obviously meaty — meal supplement drinks has been launched! The drinks are being marketed as “High Efficiency Survival Beverages”, made of “only the finest protein – an organic compound composed of carbon, hydrogen, oxygen and nitrogen”. What flavours can you hope to enjoy? Over 60, including: Cheeseburger, barbecued chicken wings, Italian Sausage, Wiener Schnitzel, Beef Jerky, Pekin Duck, tandoori chicken, bangers n’ mash and the No. 1 selling Hungarian Goulash! For those with a taste for the finer things in life, the company also offers “luxury” flavors such as Escargots Chantecleer and Moules Frites! To toast to a healthier lifestyle, four new offbeat offerings that are vegan-friendly and devoid of animal byproducts are also on the market. Plus, you can also get your greens on the go! Grilled Chicken or Salmon Salad maybe? Apparently, you are what you eat — and I guess in this case, what you drink! Curious?! Dinnerinabottle.com is their website! I posted about this myself today, and it was a pleasure to read your take on it kimsulli.